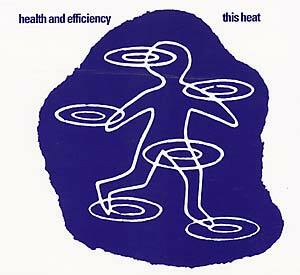 "Between Blue & Yellow and Deceit came the 3" EP, Health and Efficiency. It bridges a gap between the mostly improvisational former, and the highly composed latter, showing great diversity in the band's sound in general, as well as nicely documenting their two extreme directions. The title track is This Heat's single most high-energy piece ever, and is a tour de force of singing, ensemble playing and sound texture. It is propelled along by Charles Bullen's signature guitar strumming & ratcheting harsh picking, and includes an extended coda section, where the solos are tape loops and field recordings of such unlikely 'instruments' as dishes clanking around in the sink, a children's playground, metal clangings, hoots & howls, as well as tons of tonalities whose impetuses can only be guessed at now. It evokes the darkest aspects of This Heat's musical beauty, and the drumming throughout is explosive. 'Graphic/Varispeed' is a completely different kettle of fish; a trance-like VSO experiment meant (on vinyl) to be listened to at 33 1/3 and 16 rpm, as well as the original 45 rpm (the version on this disk): A single tape loop from a section of the first album is processed to the point of unfamiliarity, stripping it of almost all motion, save for the changing of pitches, which become increasingly more radical as the piece unfolds. It is one of the band's most experimentally sound moments, and serves as the direct antithesis to the title track."